I don�t adhere to any particular school of thought, except in the broadest sense that my writing is inextricably bound up with my feminism. This would be the only real connector between my books. I am interested in trying to find ways in which language may be interrupted, disrupted and rejigged for feminist purposes (among others). Usually this attempt would arise from something in either my personal life or the world around me. My home state is currently enacting a legal clamp-down on women, with regard to street prostitution�passing laws that restrict women�s movements and rights to occupy space. Though such factors are often what �provokes� me into a poem, the poem equally draws life off other books (like most poets, I spend a lot of time reading). I work by a kind of principle of immersion in particular poets at particular times. an honest woman of him yet. Red-eyed in the red light. her head and she lived happily. so I bend where I lonely began. manner born. Golden. That�s what the boys do. out. In a word our walls are pervious. immune. Still here and counting. of St Catherine, let her paint an inch thick. Bio: Tracy Ryan was born and grew up in the suburbs of Perth, Western Australia. She has recently been teaching writing and literary theory at three different universities, and has worked in libraries, offices, and book stores. For most of the past five years she has been living in Cambridge, England, though she has spent much of 2000 in Perth, working on a new full-length book of poems called Hothouse, as well as on a shorter work, Precinct. 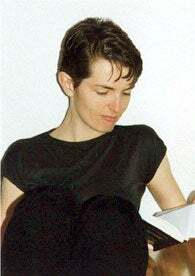 Tracy has been a poetry editor on magazines and worked in small publishing, and has a deep interest in language-learning and translation.